So you want to pick winning lottery numbers? Congratulations, you've got something in common with the rest of the world! Now, I'm not going to spin you a "magic" formula, or promise that by following a few simple steps you will win the lottery. Instead I'm going to offer some genuinely helpful tips that will give you a realistic chance of improving your odds. First off, if you've stumbled across a website advertising a guaranteed winning formula for winning the lottery, which could be yours in return for a small donation, you've found yourself a scam. Think about it, if you were sat in your bedroom and figured out how to cheat the lottery, would you really sell off the method for £19.99 a go on a cheesy looking website? Of course not! You'd win a couple of big jackpots, pack your Louis Vuitton suitcase and hop on a plane to the sun. Sadly, like with all things in life, there are no shortcuts or quick fixes, but there are smart and logical ways to pick lotto numbers, and we're going to tell you all about them. Picking popular numbers won't hinder your chances of winning big, but it will have a negative impact on the amount you win. If there are multiple jackpot winners the prize money is split between them, meaning you bank a lot less for your winning Betslip. If you've opted for a popular line, and 100 other people have the same numbers as you, your jackpot would end up being split between 100 people. Say you're numbers came up and 100 of you scooped a whopping £100,000,000 jackpot, you'd only end up with £1,000,000 each. Sure, that is a great windfall, and easily enough to retire on, but if you've beaten insane odds to win a jackpot, you want to be walking away with insane money too. Alternatively, if you just have a good feeling about your popular line, enable our unique NumberShield feature when you bet, and ensure that no matter how many winners there are, you bank the full jackpot. While it might not feel like it sometimes, there is no luck behind certain numbers or specially selected lotto lines. In every draw, every number has the same odds of appearing, regardless of what has happened in previous events. If number 50 has appeared in every draw for the last year, and number 1 hasn't appeared at all, the odds of 50 and 1 appearing in the next draw are no different. That's why we recommend opting for a Quick Pick, the automatically generated set of numbers have just as much chance of appearing as any other combination. Plus, you'll be less likely to split your potential winnings as fewer people will have that combo. Lottoland has a whole host of promotions, giving you discount and free bets on your favourite lotteries, so make the most of them! This tip couldn't be simpler, the more lines you enter into a jackpot, the better your chances are of winning. 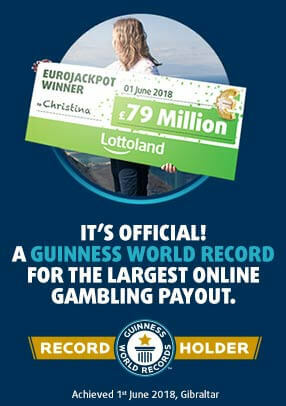 Some Lottolanders like to save up their lotto money for bigger jackpots, allowing them to purchase several betting lines for special draws and boost their chances of winning big. Another great way of doing this, while keeping costs low, is to bet in a syndicate. As these can be tricky to organise, we've created our very own Lottoland syndicates. For more details on this great way to improve your chances, click here. The joy of having over 25 different lotteries to choose from is that you can pick one that is best for you. If you don't want to bet a lot each week, you could always enter one of our cheaper lotto draws with additional bets, thereby improving your chances of banking a jackpot, without increasing your weekly outlay. For example: you could get 10 MINI Lotto lines for the price of one MegaMillions bet. Of course, you wouldn't be looking at the same sort of prize money, but you would be more likely to win. We've already covered the issue with popular numbers, but there are some other number selection strategies that will definitely jeopardise your chance of winning. A lot of lotto bettors pick birthdays for their line, however this limits your potential pool of numbers to 31. Most lotto draws have number ranges between 50 and 70, so you're cutting out around half of the potential winners before you've even started! Most common / most overdue numbers are also a popular choice, because our brains tell us that they should appear soon. However statistically this just isn't the case. It's all about cold hard maths, and every ball has the same chance of being drawn. There we have it, a few real ways to boost your chances of picking those winning lotto numbers.